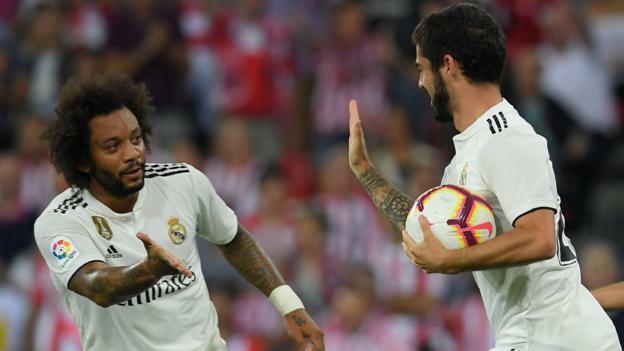 Substitute Isco rescued a point for Real Madrid as their winning start to the season came to an end against Athletic Bilbao. Iker Muniain had put Eduardo Berizzo’s Bilbao ahead on 32 minutes after Real failed to clear their lines. But, less than three minutes after coming on, Isco converted Gareth Bale’s cross to earn Los Blancos a point. Earlier, Barcelona came from behind to maintain their perfect start to the season, defeating Real Sociedad 2-1. Real had won their first three games in La Liga, scoring four goals in each of their previous two games, and they started quickly at the San Mames Stadium, Luka Modric seeing an effort blocked in the opening minute. But Bilbao, playing just their second match of the season, settled into the game and caused the visitors problems, with both Markel Susaeta and Yuri Berchiche registering early attempts on former Chelsea goalkeeper Thibaut Courtois’ goal. Despite not playing a competitive fixture in almost three weeks, following the postponement of their match against Rayo Vallecano before the international break, the hosts were the better side in the first half and limited Julen Lopetegui’s side to long-range attempts. Bilbao’s 21-year-old goalkeeper Unai Simon produced several good saves when called upon, denying both Marco Asensio and Modric – but he was powerless to prevent Isco’s glancing header on 63 minutes. A resurgent Real could have been ahead soon after, but the impressive Simon denied Sergio Ramos from close range. Neither side was able to force a winner in the closing stages, however, as Real – who remain second in the table – lost early ground on champions Barcelona. Next Lopetegui’s side begin the defence of their Champions League crown at home to Roma on Wednesday (20:00 BST), before returning to league duties against Espanyol on Saturday (19:45 BST).